A project with schools that will use the empathic potential of design. In collaboration with NSFT we plan to run a project with schools in Norfolk that will use design, as a process of empathy, to help rural communities use preventative strategies to improve the mental wellbeing of children and young people. 20 November 2015. Written for an external funding submission. 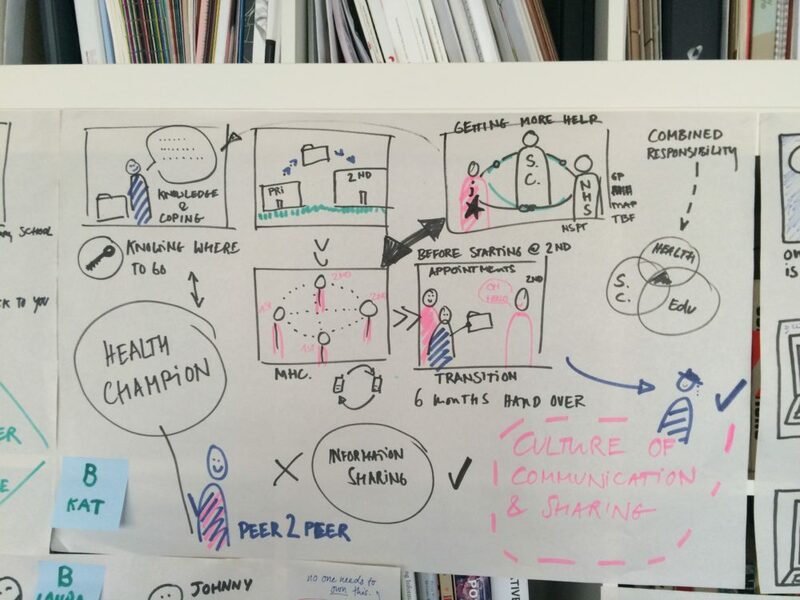 Sketch sheet from Workshop B with NSFT youth mental health service clinicians and local voluntary sector partners produced during Early Lab's Field Trip to Norfolk, March 2015. From these workshop sheets the research findings were configured for use in Early Lab's proposals presentation to NSFT and senior health commissioners in July 2015. Our project will use design, as a process of empathy, to help rural communities use preventative strategies to improve the mental health of children and young people. first, the exploration and prototyping of a new school arts curriculum that maximises the empathic potentials of drama, music, art and design. second, the role definition and trialling of a new level of health champion operating in schools. Our aim through these initiatives is to help create a community culture more receptive to preventative strategies that would make greater public investment in preventative health systems more worthwhile. Through this activity we hope to be taking the first steps towards creating a new expanded cross-sector model of mental health service for children and young people. There is a lack of public investment in preventative strategies without which public health systems will continue to be unsustainable. The socially disadvantaged in rural communities are particularly vulnerable. The Early Lab team, (8-12 UAL students and two academics – Nick Bell and Fabiane Lee-Perrella) will embark on a field trip to Norfolk. For a week we will run a series of workshops working responsively with people as co-actors, making things. This is NOT therapy. Our experience in this field has proven that making things can make complex thoughts and ideas visible and therefore tangible. This will provide the impetus to turn what is presently ‘a lot of talk’, within the local youth mental health service, into a plan of action. We want the workshops to pose questions interrogating the potential of the two initiatives mentioned above in the project summary. The workshops will bring together local people, currently working to achieve the wellbeing of children and young people, who are presently unable to develop new service visions in collaboration because of the barriers endemic in a system of sectors that separates people into silos. We will then take away the workshop research findings, and through review and critical analysis, develop them into a highly visual report articulating the recommendations inspired by the collective effort. We will then present this back to all participants plus those with commissioning powers across sectors in Norfolk and Suffolk. Research indicates that the sooner young people receive adequate support the greater chance there is of preventing their condition from developing. 1 in 10 children experience a condition of mental ill health and we think the rise to 1 in 4 in adulthood can be prevented. strengthening the peer-to-peer culture of emotional support in schools and have a positive effect on the resilience of local communities, especially isolated rural and coastal communities. Our previous field trip to Norfolk was very successful and has prepared the ground for this proposal. Using the power of design as a process for empathy, we have succeeded in the area so many fail – genuine engagement with stakeholders. We think this has something to do with the fact that we work with people, not for them. Working for creates dependency whereas working with has succeeded in unlocking local capacity – latent capacities that so often remain untapped. Consequently, we have an extremely enthusiastic and motivated project partner in NSFT who believe very strongly in our engagement methods. The Early Lab approach is to travel to places where the issue under scrutiny is happening and to engage equitably and directly with people (who are enduring the issue) where they are, in their place: hence the field trip. musical accompaniment could be created for both. we will articulate our research findings to make a compelling case for school curriculum innovations and the knock-on mental health and wellbeing service adjustments to local education leaders and senior health commissioners respectively. Recruitment and selection of the multi-disciplinary Early Lab student team of designers from UAL or other interested university or college. Confirmation of all participants: primary and secondary schools, teachers, schoolchildren, youth mental health service-users, service clinicians, local authority social care managers, local youth justice representatives. Confirmation of the Norfolk venue where the workshops will happen. Deciding on the various specific making activities carried out in the workshops. Agreement on the date of the field trip and programming of the workshop series. Briefing of all field trip participants and preparation of the UAL student team. Execution of the field trip workshops together with their photographed/filmed documentation and collation of the physical objects, media and material produced in them. A series of team meetings to review, critically analyse, edit and visually configure research findings into a well articulated presentation. Interim presentation of findings to NSFT, schools and other workshop participants. Refinement of presentation in response to feedback. Final presentation of findings to NSFT, schools, workshop participants, local education leaders and senior health commissioners. Local cross-sector response by education leaders, health commissioners and NSFT serving local education policy and the local youth mental health service and its Transformation Plan respectively. Summative evaluation of the project. position the care resource to signal a clear, smooth path across all sectors to appropriate provision. At present the care pathway is a huge hurdle to climb due to poor cross-sector cooperation – it’s a system that can only respond to crisis. A smooth, clearly signposted care pathway is needed that enables the young person to take control. This is a vision of integrated provision that is preventative, creates awareness, promotes self-management, teaches coping strategies and, only if needed, delivers fast easy access to specialist services. From the moment a child enters education, activities and debates that promote emotional wellbeing should be in place. These would work as preventative methodologies and would be a part of the everyday school activities. In ‘Life Skills’, children would practice prevention through creating proxy processes for empathy (plays, films, animations) empowered by new art, design and drama curriculums. Children and young people would explore the nature and vocabulary of emotions – their own and each others. Health Champions would be available for more dedicated support. With a basic training in mental health they would have close rapport with GPs, social workers and other schools. More specialist advice would always be close at hand. Bolstered by Health Champions, peer-to-peer support would establish itself as part of school culture. However, when necessary, specialist talking therapies would be offered in convenient locations reaching out to young people.